We have been working on Wow! 2 in the last months capitalizing the know-how achieved developing plug-ins like Shape and others. We set out to develop this new outstanding version by improving performance and all existing features and adding more features to enhance user experience and speed up the workflow. We invested a lot of resources in the user interface, and all functions are now customizable. Shape is our new plugin for Photoshop CC to manage the contrast of an image and anything relates to it. The ability to control so many adjustments at once in live preview makes it easy even for photographers not expert with Photoshop. Shape will boost their images to a higher dimension. For experienced Photoshop users, Shape puts a lot of power in the very few steps. For those that are already using Know-How Transfer plugins Shape significantly reduces workflow time adding the even more stunning result. To start we asked ourselves, which kind of tool does a photographer really need? The answer was: a qualitative, powerful, flexible contrast manager given that native digital files are “flat”. Read more and watch the videos! 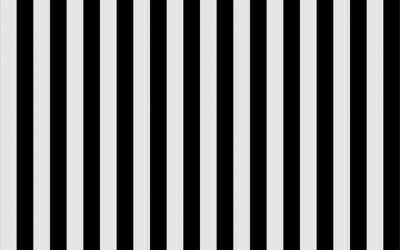 VitaminBW 2, thanks to the new super fast engine, adds a live preview. You will be able to compare different settings in a while. You can now get the black and white layer flattened or layered in a stack, exactly as VitaminBW 1, for an advanced and flexible tonal editing. Gamma is a powerful new tool that controls luminosity before the image boost. More options are the Repeat function and the auto pre-filtering. Version 1 was a script. Version 2 is a plug-in that uses its internal engine working at 32bit stretching the local histogram much better. ALCE has been our bestselling product for many years and, since the release of ALCE2, its core functionality has not changed significantly. Recently, thanks to the know-how achieved developing plugins such as Wow! and Mask Equalizer, we set out to make this outstanding product even better by improving some of ALCE’s weaknesses. Specifically, we focused on: creating a live preview, improving the embedded halos suppress tool, adding three masking sliders and finally switching to Quad-Core processing and 32bit computing capabilities, not available in Photoshop. The result was the Next Generation Local Contrast Enhancer, which we decided to rename NEXT. ALCE missed the preview. Its routine was very complex and it has been necessary to consistently improve the speed. NEXT is at least three times faster compared to ALCE at 8 bit and eight time faster at 16bit. It means virtually live preview. ALCE embedded an halos suppress tool. We have consistently improved it but, when needed you can deactivate it to get even further contrast. Despite this we still were not satistied and added a brand new masking option. We added three new masking sliders. They are hidden when you open the panel in compact mode. You can now progressively mask highlights, midtones and shadows. Works well in shadows and to remove halos in flat backgrounds. ALCE was a script, NEXT is a plug-in. It means that it uses its own engine working at 32bit without color quantization and stretching the local histogram much better. With NEXT gradations, highlights and shadows are smooth as never before. 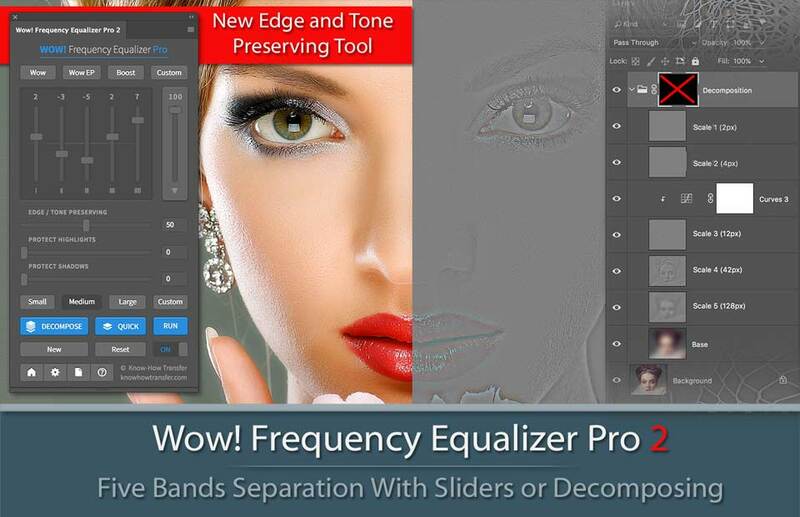 Mask Equalizer is a Photoshop plug-in to create sophisticated masks using multiple luminosity ranges quickly. 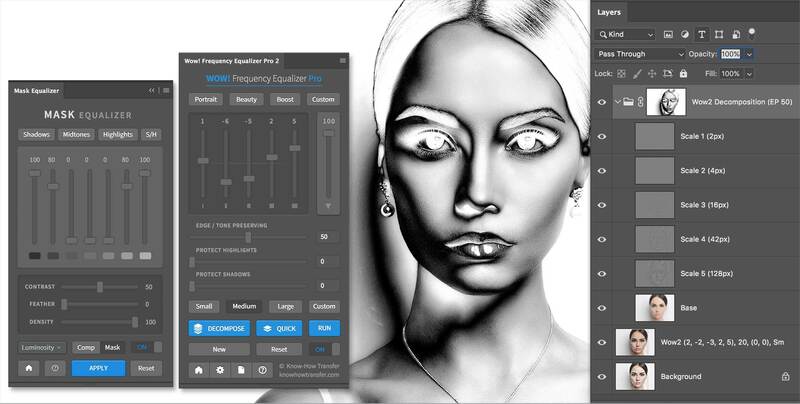 Load one preset with just one click, to start to create your perfect mask. Instantly preview the result switching back and forth from mask to comp mode. Feather the mask, modify its contrast or opacity. The plug-in works with adjustment layers, advanced objects or groups. 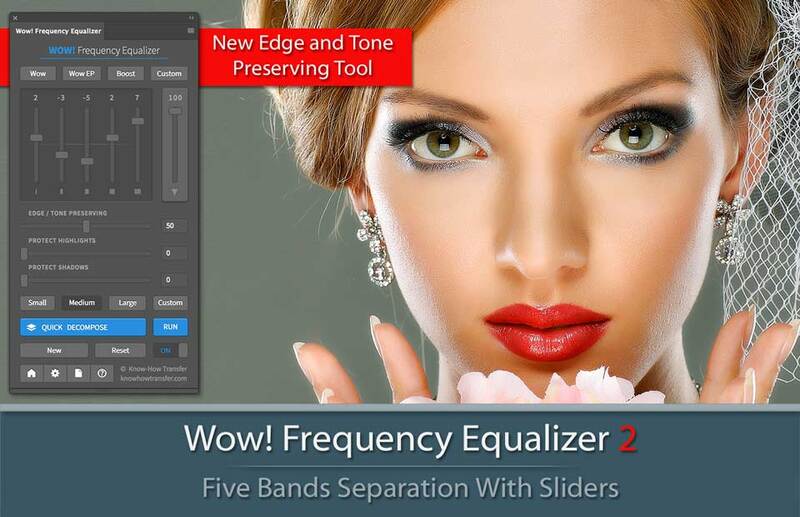 We warmly suggest considering to buy our convenient bundle of Wow Pro 2 and Mask Equalizer. This plug-in is entirely independent of Wow!, but it shines when they are used together. Usually one encounters spatial frequency separation for the first time in the field of beauty retouch. To put it as easily as possible, it is a technique which separates the texture of an image from its shape, allowing the retoucher to easily clone over defective parts with no visible side-effects. After many, many years as a photographer, I’m still fascinated by magic that happens behind the camera. Join me, for some of my favorite photoshoots. We just redesigned the store that now is more functional. 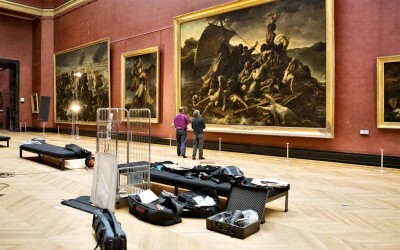 It’s now possible to buy in Euros or US Dollars, and convenient multi-licenses purchase is available for all products. Everyone dealing with photography and digital imaging will find a unique mix of instructional and how-to content here. We offer applications specifically designed by photographers for photographers, as well as useful tutorials and free resources. Our mission is to create a community, a Central Hub of Photography Knowledge, where photographers can exchange experiences, share information and grow their skills.